You may be thinking that I wear a lot of dresses during the summer months. C’est vrai! You are not imagining it. 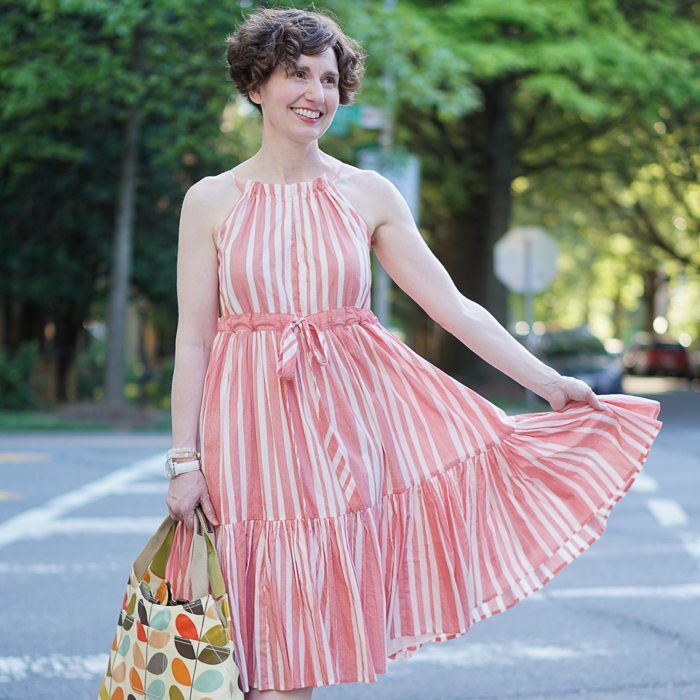 On the one hand, I feel a little guilty about showing so many dresses, because there’s little scope for imagination (in the words of Anne Shirley) in how to wear a dress. In general, the challenge is in selecting the right dress and sometimes that’s just a function of . . . shopping. But on the other hand, dresses are comfortable and cool in hot weather and thus are a strategy of sorts. And they do need to be accessorized and can be worn creatively, as I suggest here and here. So here’s another dress! It won’t be the last you see this summer. 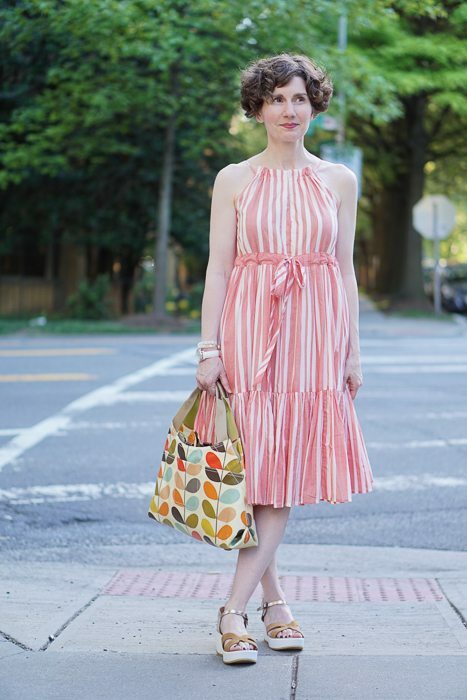 This dress cannot be worn to work because, um, it’s kind of a halter dress. Those little strings across my shoulders aren’t providing much coverage. This dress is for weekends or for work activities after-hours: taking the summer associates to see the Nationals or pool parties. You want to see the skirt of this dress? Now on sale at Anthropologie! Link below! 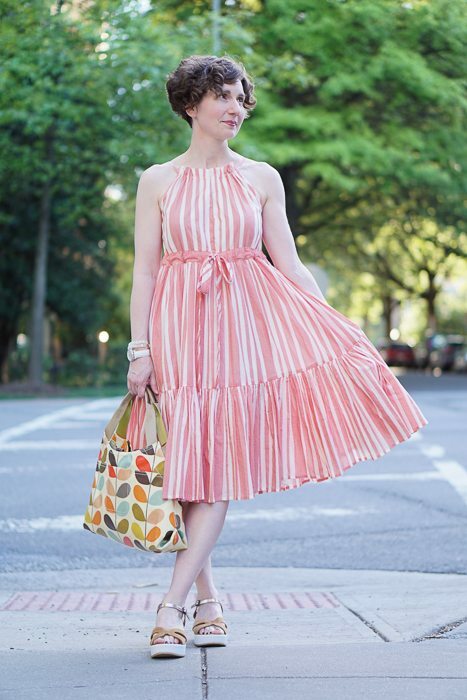 To demonstrate how one’s old clothes can be re-styled — to teach something — I am tossing in this new photo of a dress that I showed you last summer. 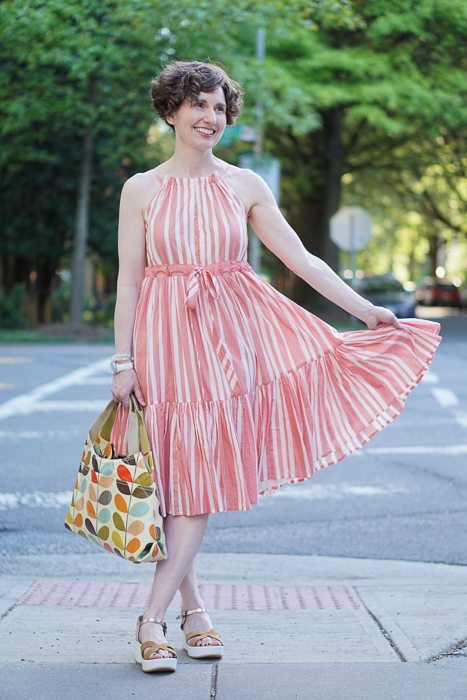 While the lines of this dress are totally classic — round neckline, fitted bodice, pleated skirt — the stripes add a certain joie de vivre. Last year, I showed it with conventional (although very pleasing to me) accessories: a bag and shoes in a tan color. Here, the dress looks a little different with wedge sandals and a blue bag. Note how beautifully the white platform of the shoes brings out the white stripes in the dress. This is the same necklace I showed last year; this year I’ve tied it like a choker. Keeping things fresh. Listen. I figure that I will be working for at least another 18 years, so we have a lot of days.weeks.months to fill. I can’t promise radical innovations every week. 1. You have an avant-garde but modest (ie wearable) aesthetic. I love seeing how you remix clothes too and that this is a Style blog not a Trend blog. 2. You are not a 20-something being given free clothing and accessories to promote. 3. Your writing makes me smile. Your sense of humour comes across as genuine, not forced or false. If I had to sum up your blog, I would say it is “relevant” i.e. applicable to my life. But then again, I am exactly your target readership audience. For example. based on your blog’s excellent teachings, I have these outfit plans for autumn: a) Red shoes (currently orphans) should work with an all-black outfit; b) Black blouse must be purchased and c) Voile blouses might be the solution for dresses without sleeves. Another selling point of your blog: Flat shoes! Seems a negligible detail, but your photos are fresh because the whole outfit is a composition. So rare! Mass market retailers in particular (Banana Republic I am looking at you) seem to rely on the visual formula: Banal outfit + stunning heels. Eek! I am sorry I missed your question, AV. I like a dark blue bag. I have one that is a patent leather with some striated texture to it. I use this bag a lot in the spring and summer months with all-black ensembles as well as white and navy. My one suggestion regarding a navy bag is that it perhaps works best if it’s patent leather or suede. That’s just a hunch I have and it may be incorrect. Good luck! Your blog is different from the others I follow due to your modification of clothing. I love how you think outside the box when it comes to clothes. Grown-up but not fusty. Polished but not prim. Mildly luxurious but not out of reach. Avant garde but not bonkers. Creative but not I-will-never-do-that-diy. Your blog is relevant to me because I, too, am a lawyer but I, too, dislike wearing “lawyer uniform” every day. I like keeping things interesting and integrating my personal style into an otherwise conservative environment. I think of it as brightening my small corner of the office. 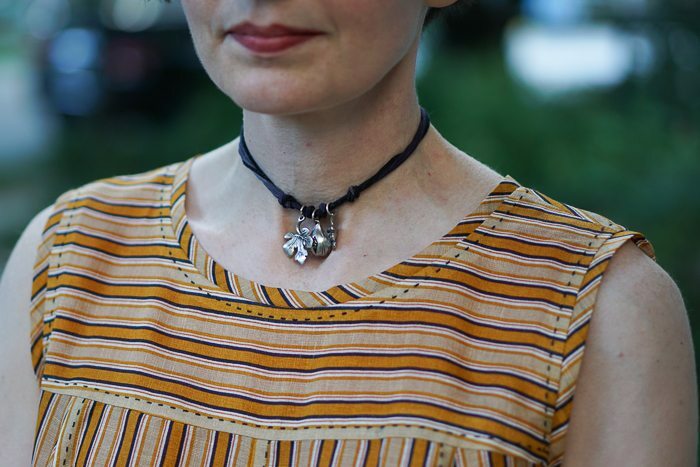 If I were to describe your blog to someone, I would say it showed artistic and imaginative variations on professional office attire, particularly for women who are more established in their professions. Does that help? I would describe it as irreverent dressing for conservative and professional environments. Your blog is the only resource I have found which has given me guidance on how to express my personality through my clothes whilst remaining professionally dressed. I work in a male dominated field in academia and have essentially no female role models to demonstrate appropriate ways of dressing. PS I have recently bought a shirt dress following your advice, and have a cropped jacket which I now think of as my directrice jacket. How gratifying! Hopefully I am not guiding all of us into a wilderness of professional ostracization! I don’t think so. You are not the first academic to comment on a lack of sartorial role models, which is so interesting to me. I assumed that a campus would be filled with free-thinking, experimental dressers. Perhaps you need to sneak over to one of the humanities buildings . . . Am I wrong to imagine that you are in the hard sciences or engineering? I’m a theoretical physicist, so definitely hard sciences! You’re right that I should find some ways to mingle with other faculties. University departments can be absurdly cliquey. I should have said before that as well as enjoying your blog for practical advice, I love your writing and the beautiful photography. Congratulations to you and the photographer! Well. Let me see how to answer this. I am certainly not your target audience, as I am a writer working from my home office and could do my job buck naked if I chose. I do not so choose, but you take my meaning. I have a sum total of four dresses and four skirts (three from the latter group are being dismissed), and jeans and shorts make up the bulk of my wardrobe. Oh, and OUTERWEAR, which I love, collect, and wear. We have very little in common except adorable cats. Yet I love your blog for your appealing writing, humor, and creativity with your professional and non-professional wear. Your examples often make me consider how to wear something in a different way, or consider items I might in the past have rejected. You boss your clothes around in a manner I respect and have decided to emulate. So, I always look forward to your postings, as they are, for me, like reading about an unexplored, yet exciting country, sartorially speaking. In other words, a delight. Plus, we also live in the same city, and so share the same climatic challenges that that poses. Your blog appeals to me in many ways: I’m 47, I have curly hair, I wear glasses and I am “the boss” at work, setting an example of professional dress while enjoying a creative bent. I am the director at a school for the Deaf (thus your husband’s CI usage is also kizmet). Your modest sensibility is admirable, your taste level is divine, and your minimal usage of accessories is delightful – thank you for sharing ideas and combinations that are a pleasure to see! I knew I liked your blog the moment I saw the red Coach shoes that also have a place in my closet. Yeah! Creative, luxe, attainable style for bosses! (or – mid-career ladies of style). I always want my clothes to be creative and witty, but at the same time want them to clearly pass professional muster. Clothes that people admire but couldn’t denigrate for not being professional. You nail that. Witty has to be in your description somewhere, I’d say. I must echo Kate in all ways except that I don’t live in DC but the far off outpost of Santa Cruz, California. Ditto on the adorable cat, ditto that I’m also a writer who may not work buck naked but gives far too much air time to pajamas during the day, and ditto on the love for outerwear. My own two cents -you’re funny, artsy, engaging, entertaining, colorful, accessibly experimental (if there is such a thing), and you stretch my thinking, style-wise. I subscribe and always look forward to new posts in my in-box. I love that you mention hours and days and years in terms of postings because it means you’re in this crazy shindig for the long haul. Lucky us. I’ve described your blog as “inventive, occasionally rebellious, yet realistic twists on workwear” — as others have said above, I like the mix of old and new pieces, interesting brands that aren’t always “flattering” in the traditional sense of the word, and personal style & humor. Over-monetization has ruined several blogs for me that I used to enjoy (the main one coming to mind at present being XXXXX XXXXXX), as instead of unique pieces and personal style, and honest reviews as to fit, quality, and value, bloggers are shilling whatever their contract with Ann Taylor is telling them to shill. I tell women about your blog because it is funny, you don’t take yourself seriously, your poses are fun and relaxed (do not get me started on bloggers who think they’re models), and you give really solid advice on issues we all struggle with: alterations, shoe care and storage, transitional dressing between seasons, and having quality, timeless basics on which to build a great wardrobe. I’m now on the lookout for an exciting white blouse to jazz up otherwise basic skirts and pants, and I really want a plaid strapless dress to wear over a simple blouse after your post the other day. LOVED that look. Have you thought of linking The Directrice facebook to instagram? Good way to find new followers. I have a thing about people who describe themselves as either witty or edgy; go ahead and load up on synonyms for those but please don’t apply those labels, even if they’re kind of on the mark. I think an urban professional in a conservative profession who looks for a stylistic edge that doesn’t include ( a lot) of leather or black is a start. You might be thinking about phrases that includes “dressmaker details” because I think a lot of what we see has subtle tailoring and feminine detailing. That second dress looks like it could go from high summer into warm autumn very nicely. I have to have a say here too, as this post of yours seems to request our indulgence of your dresses. I adore dresses and wear them a lot. You certainly are braver than I am when it comes to dressing, and I find your approach inspiring and a great relief from the feeling that my outfits need to be conventionally flattering. I love to see the way you compose your ensembles and to read about your thoughts behind you the pieces that you choose to wear. It doesn’t hurt that you are funny and witty and wise! I love that you are a proper grown up, with a responsible job and that you have fun with your wardrobe and life. Even though we’re almost the same age, and have a similar job, I can’t shake the feeling I want to be like you when I grow up. Echoing everyone, not an original thought here. I particularly love Justine’s phrase “a proper grown up” and your “urban professional in a conservative” field vibe. Those things set you and your blog apart from the usuals. I look at others, but yours is the first that has actually helped me evaluate and curate my professional wardrobe. with me as I’m also in a male dominated field of academia and have found the Directrice helpful in crafting a creative yet professional style. I see the Directrice Blog as being intelligent. Here’s what I like — you’re intelligent. I could imagine having a real conversation with you, and only marginally about what you’re wearing. You strike me as a person with a great sense of humor and a delightful way with words. I look forward to your posts, even though I’m tall, clunky, fashion-challenged, and hopelessly out of date. Doesn’t matter! We’re friends! Hi Hope — I checked out your blog and subscribed to your newsletter/alerts! Your writing is funny and charming and I admire the guts it takes (which you demonstrate) to not only share creative output, but to do so when it clearly reflects your internal life, experiences, and uncertainties. Hurrah for the writers and artists! Thank you so much for sharing. As a 31-year old low-income teacher living in Germany (and a vegan to boot), I may be an unlikely fan. – Your writing is delicious. Even if you never shared another outfit, I’d keep reading. – Your bold-but-not-preposterous style is inspiring. – We all like to see how the other side lives, don’t we? Will you allow a bit of unsolicited feedback? Your Facebook page isn’t doing you justice. Neither the profile photo nor the header capture your style and charm. Once they better reflect your blog’s aesthetic, it will be easier for your readers/fans to spread the good word. Continuing to use Pinterest will also help interested parties find your blog. Personally, I LOVE seeing bloggers re-wear and re-style things. Thank you for your work. It’s a treat. Your style (clothing-wise) is elegant, yet experimental and witty, your style (writing-wise) is wry and droll and self-deprecating, and you never, ever take yourself too seriously. I love the sly digs you take at yourself. This blog is entertainment for me. I enjoy the writing, and the pictures are fun to look at, too. I see we have a collection of non-target audience readers, including myself. I would love to dress, at least occasionally, in formal business attire. That just doesn’t work in my casual but professional workplace. It’s nice to see you wearing outfits that are not stiffly formal, but still have a certain polish. And flats! I like flats! Love the blog! I would describe it as a real lawyer’s creative business attire. Love your aesthetic and it’s a good reminder to me not to succumb to fast fashion but consider that at this point, certain things I acquire will stay with me awhile. Agree that your writing is delightful! While our aesthetics are not always interchangeable (yet I’ve been going back and forth on the Cambridge Satchel you featured some time ago), I wholly enjoy the persona of your blog and the awareness you have for the D.C.-professional vibe and your appreciation of sophisticated dressing. Seconding Alexa, as well, on my enjoyment of your “Lizzie Bennet” tone.